SANTA ROSA, CA – January 25, 2018 – When untrained pets posing as service dogs behave badly, people who truly need service dogs can face added discrimination and lose access to public places. Canine Companions for Independence frequently hears from graduates who have experienced access denials or encountered aggressive or otherwise ill-behaved animals being misrepresented as emotional support or service animals on air carriers. Canine Companions has reviewed Delta Airlines’ new policies for travelers with emotional support and service animals and appreciates the intent behind Delta’s revised regulations. Unfortunately, there are several elements of Delta’s new policies that are not in line with the Air Carriers Access Act (ACAA), the law that prohibits discrimination against individuals with disabilities by commercial air carriers, such as Delta. Under the current wording of the Department of Transportation’s (DOT) guidance, (Nondiscrimination on the Basis of Disability In Air Travel (May 13, 2008): Guidance Concerning Service Animals), “the law allows airline personnel to ask for documentation as a means of verifying that the animal is a service animal, but DOT’s rules tell carriers not to require documentation as a condition for permitting an individual to travel with his or her service animal in the cabin unless a passenger’s verbal assurance is not credible.” However, Delta’s new policy requires documentation of a service animal’s vaccination record by a licensed veterinarian. While the form, once filled out, remains valid for one year, it nevertheless requires service dog users to make an additional visit to a veterinarian to have Delta’s carrier-specific form filled out. Furthermore, Delta requires that this documentation be submitted no later than 48 hours in advance of the flight. Unfortunately, this requirement in all likelihood will be impossible for any service dog user attempting to travel with their service animal on an emergency basis. At the time of writing, the DOT’s website, updated November 2017, also clearly states that service dogs do not require additional documentation but that 48-hour advance documentation and notice can be requested for emotional support animals and psychiatric service dogs. Service dogs are more than a vest purchased for a few dollars online. They require years of expert training to perform specific commands and provide calm, reliable assistance to people with disabilities. However, any solution to this issue should attempt not only to prevent fraud, but also to support and streamline access for legitimate service animal users. 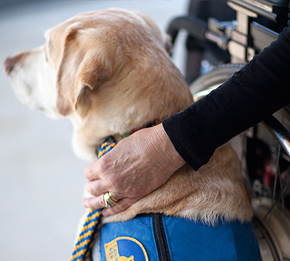 Canine Companions for Independence seeks the opportunity to work with air carriers like Delta to provide crucial input to help create reasonable policies that address the concerns of airlines, personnel and travelers while protecting the rights of legitimate service animal users. UPDATE: Canine Companions is pleased that Delta Airlines will be working with Canine Companions to work towards solving the issues. We applaud Delta for their responsiveness to the industry’s concerns and look forward to a productive dialogue. Non-profit Canine Companions for Independence provides highly-trained assistance dogs to children, adults and veterans with disabilities. Established in 1975, Canine Companions created the concept of dogs helping people with physical disabilities. With six training centers across the country, Canine Companions is recognized worldwide for the excellence of its dogs, and the quality and longevity of the matches it makes between dogs and people. For more information, visit cci.org or call 1-800-572-BARK.